Exception handling is one of the major areas of an application development and when it is a web application, it requires additional care so that errors gets handled gracefully without breaking the complete system and relevant information is shown to the users with proper error message. Also making sure that no internal details gets propagated till user when application crashes or error occur because it could be a major security threat. All the exception details and other additional information should be logged so that it can be later used for proper investigation. In this post we will talk about the few options available to handle the exception in ASP.NET MVC and best practices to use them. So we can see here that there are four filters in total and exception filter executes at end. It means if we use exception filter then it will be caught there whether the exception occurs in Action or even in Authorization/Action/Result filters. Note – Filters are added as an attribute so it also inherits from ‘System.Attribute’. Broadly we can say that exceptions may occur in controller or in some cases while processing the routes and filters. But as most of our core logic resides in action so the chances in are most. Before focusing on filters, let’s first discuss one basic way to handle to exception that is part of C#. This is C# feature and one of the basic ways to handle exceptions so we can wrap all our code in our Action as below. But there are many issues with this approach and the primary issue is the limitation to single Action. To handle that, we need to put try catch block in each Action of the application which is repeating the same exception handling code which defies the code re-usability logic. It does not mean that we should never use it but there are some scenarios where we require to perform some another activity in case of exception without letting the user know or more specifically if you are calling to some third part services etc. then it might be a good Idea to use this approach. Global error handling is one of the simplest way to handle exceptions at application level. It leverages the Exception Filter to handle exception and applies at application level itself. This is out of the box feature and can be easily set up by following step. Have a common error view (in Shared folder with name error.cshtml) which will be shown in case of error as Here we see that we get a model of type HandleErrorInfo class which provides the details about that error occurred, controller and action name etc. Now if any error occurs then error view will be shown. Here we can log our exception, send the mail etc. and set our own view that will be shown (like here I used CustomErrorView) in case of error. But this code won’t be reusable and need to write in each controller wherever we need. Now this custom error attribute will be used in the whole application. Note – Here I have put ‘MyCustomHandleError’ as an attribute. We can use default ‘HandleError’ attribute instead of custom one. Here if DivideByZeroException occurs then view DVZ will be loaded else default one would be loaded. We can add as many type of exception based on requirement. Also similarly we can apply at Controller level as well. In OnException method, you must have seen the following line many times. As the name suggests that when we set it true (default: false), then the exception does not propagate further and it is handled in the same method. Say we have put the Exception Filter at action, added a Global exception filer and we did not set the ExceptionHandled filter or set it false then once the exception is caught by action level exception filter that will be thrown further to next level and caught at global filter. Normally when we handle exception we make it false because we have already handled the exception. But there could be few scenarios where we do something with exception details and throw it further so accordingly we need to set this property. Note: Application_Error should not be used in replacement MVC global exception filer, because as soon as you get out of MVC scope, you won’t get its execution context which is very important to provide the relevant details about the exception. We have discussed various possible ways of handling exceptions. We find that all the exception handling moves around the handle error attribute with many variations. Another two that we discussed: using try catch block and using Application_Error. Best solution for any application would be a combination of these approaches like extend HandleErrorAttribute based on the requirement and use it accordingly. Application Error should be used as if an exception somehow find its way to get out from MVC scope, then it will be caught here. Try Catch block should be really avoided as it just not makes the code ugly but we can miss lots of relevant information that may be helpful in fixing the issue so unless specific case, do not use it. Today we will write unit tests for following components. Note – This post is a part of series of posts on AngularJS and it is 20th one. Click here to view all the post. Apart from that you can also use the navigation links for next and previous post in each post at the bottom to check all. Above code is self-explanatory. First we are initializing the mock service, calling the service and finally verifying the response. We can configure httpBackend for different scenarios based on usage of $http in actual service. Directives are again one of the most important components for AngularJS. Writing Custom Directive is a complex task because it is not just another function which can be injected and called from anywhere. Custom Directives are declaratively used in HTML. As it directly changes the view and also designed in a way to be reused at different views, provided the scope is properly isolated based on requirement, these should be properly tested. As in the template, we have input which allows to change the scope object, this reflects in the parent scope as well. Here we got the compiled directive using compiler service and run the digest cycle same as earlier one. One extra line added to get the isolate scope from the compiled directive and checking whether talkInfo is defined. We have written the unit tests few very important components of AngularJS. Although many more test could be written and even these components vary based on requirement, accordingly different unit test may be required. But in this post, I tried to provide the basics of writing unit test for these test. Do share your feedback or face any difficulty for writing unit test for any specific component. I will try to answer that. In last two posts, we explored about the Filters and saw that how easily we can create custom filter and use as Angular predefined filters. We have used these filters in views for a single as well as an array of items. This is a normal scenario but there could be some cases where you need to use these filters in other components like Controllers, Factory, and Services etc. I have seen many questions around this on different online forums. So I thought to discuss it in detail. If you are new to Angular Filter or even if you have some idea about, I will highly recommend you to go through my below two earlier Posts then continue. In this post, I will use the same examples that I used in my previous two posts as well. This post is in continuation of my previous post regarding Filters. (Click here to go to previous post). In last post we discussed about the basics of Angular Filters and found that how easy is to use the predefined filters with examples. This post is also fourteenth post in the series of AngularJS and to see all the previous posts, click here. In this post, we will be discussing about custom Filter, its uses and create a few custom ones. Also we’ll try to explore some more flavors of the filters. We discussed two main types of Filters in previous post, one that transforms a single item in different format. Another one that can be applied on array of items which produces another array after applying Filter .The resultant array could have same or less number of elements and contain same or transformed data. As we discussed in my earlier posts that Modules in Angular are like containers. It is a top level element and contains all the components of AngularJS. So every custom items must be registered with it. Same is true here as well. Let’s start creating a filter of first type, we already saw some Filters like uppercase, lowercase, currency etc. Now we are going to create a Filter which currently does not exist. It takes a string of numbers and convert into phone number format. Excited? AngularJS is one of the hottest technologies currently in market. Every web project built on any platform whether .NET, JAVA, PHP or any other, all are just embracing it. It is because the kind of power, flexibility, openness and many other awesome features provided by AngularJS. But I would say even we are using this framework in most of our web applications, but we are not leveraging the real power of of many features. In this post, I am going to discuss about Filters and how to get best out of it. 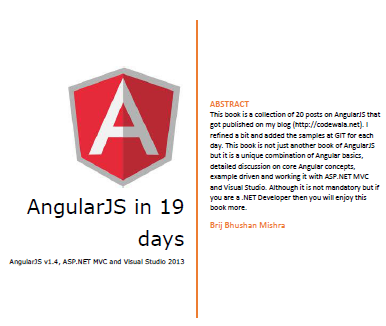 This post is again in the series of Posts of AngularJS and it is thirteenth in the list. To go though the previous posts in the series, click here. Filters is one of key features provided by AngularJS and almost used in every web application. In this post, we will be exploring it with bunch of examples. We’ll start from basics then dig deep and create our own custom filter at the end.